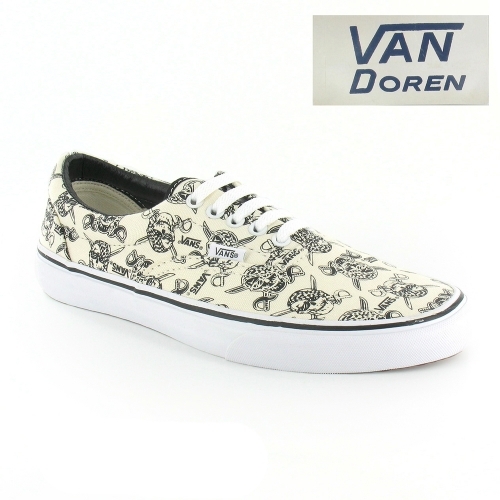 Named after James Van Doren, co-founder of the Van Doren Rubber Company, this great unisex Vans Era shoe has an off-white canvas upper with black pirate skulls print, and detail stitching to the heel, sides, across the front and around the padded topline. This stitching is also found along the eyelet line which runs up the front of the Vans unisex shoe where five pair of white coloured eyelets are fastened with flattened white laces over a flexible tongue. Inside, the Vans Era VQFK6GB unisex classic shoe is lined in off-white, while for your comfort this great Van Doran unisex lace-up has a padded insole, and in true Vans style the flexible rubber waffle sole unit of the Vans Era unisex casual lace-up shoe continues to provide a comfortable walking experience for men and women. A deep white midsole travels around this great shoe with a thin line of black piping at the top and 'Van Doran' branding at the heel. With a retro appeal and classic styling that takes you straight to the American college system and the Beach Boys surf sounds, the Vans Van Doran Era is a great shoe for you - get your pair now.